- Palladium at 16 year highs today; gold, silver in coming months? This morning readers woke to the news that a second attack in 24 hours had taken place in Barcelona. So-called Islamic State claimed responsibility for the attacks in Spain. Global stocks has fallen and precious metals have eked out gains this morning as investors seek out safe haven assets. Gold has risen to trade at its highest level since the beginning of June. Gold’s reaction to the Barcelona events is likely to last and may continue today. The combination of heightened risk in the global geopolitical sphere is likely to support both gold and silver, pushing them through recent resistance. A weekly close above $1,300 per ounce will be very positive for gold and should see a rapid move to test the $1,400 level. After losses earlier in the week, gold and silver have come right back and are now up 0.55% and 0.64% respectively. This is very positive as profit taking was to be expected after last weeks strong gains. 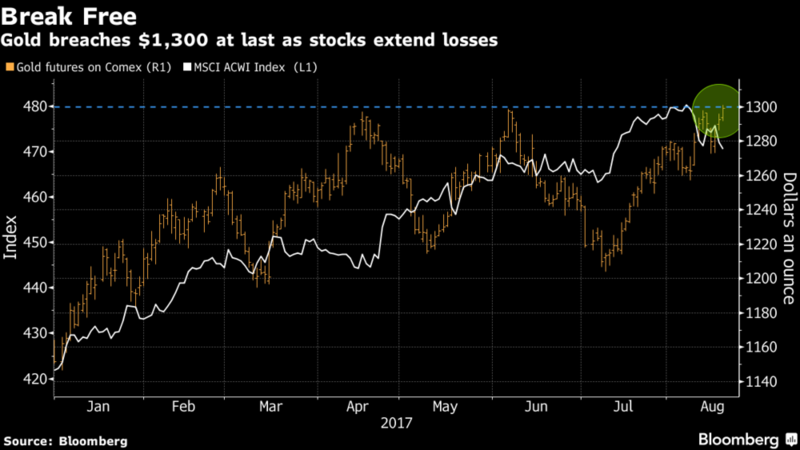 Gold and silver have consistently remained in the top-performing assets throughout the year and are beginning to outperform stocks. In the year to date, gold is up nearly 13% whilst silver has climbed over 7.5%. The benchmark S&P500 is up 8.6% after weakness last week and this. Both precious metals have performed well thanks to safe haven demand, much of which has been driven by very strong demand in India, China and Asia and ETF-demand in Europe. Palladium is up over 36% in the year-to-date and is the best performing commodity and market this year. Consumption of the rare industrial precious metal is expected to hit 10.8 million ounces this year, an all-time high. Demand from the automotive industry, the biggest buyer of the metal, is up 4% this year. Due to the high demand and limited availability of palladium there is market deficit of over 1 million ounces. The apparent five-year-long market deficit has begun to impact the availability of above-ground stocks. This has prompted leasing rates to dramatically increase, taking the palladium market into backwardation of around 5-10%/year. Much of palladium’s increased demand is thanks to increased demand for SUV vehicles which have to abide by tightening emission legislation from the EU. The latest announcement in the UK regarding a ban on diesel engines will also help to boost demand as consumers shift from diesel to petrol engines. This suggests that there is little let-up for the tight supply conditions the palladium market is currently experiencing. Safe haven demand is coming back and is again one of the firm drivers of precious metal prices. We have seen strong demand in August in what is frequently a quieter month as investors switch off and go on holidays. We are operating in a very nervous financial and geopolitical environment globally. Geopolitical events can lead to price gains and safe haven demand. But the real risk is that a massive terrorist event or a cluster of many such events could impact consumer confidence, markets and the wider global economy. And geopolitical risk is also seen in the complete mess that is U.S. politics and the Trump Presidency. For instance, the latest drama from the Trump camp regarding the collapse of his business councils, is not in itself a reason to rush to precious metals. However, it is another sign of the cracks emerging in Trump’s administration and their complete inability to deliver on campaign promises. The same can be said for the President’s reaction to the Charlottesville tragedy at the weekend. Both events (added to all issues since January) suggest that the current White House administration are perhaps losing sight of what it means to run the world’s declining super power. Leading from struggles in the White House, the combative approaches of President Trump and North Korea ruler Kim Jong Un throughout the year has also helped to provide safe haven support for gold and silver. - Vladimir Putin’s geo-political ambitions combined with Russia's growing closeness with China. - Signs of growing differences between many Western allies, significantly President Trump and European leaders in regard to how to deal with the above. In recent months gold has attempted to break through the $1,300 barrier a few times. 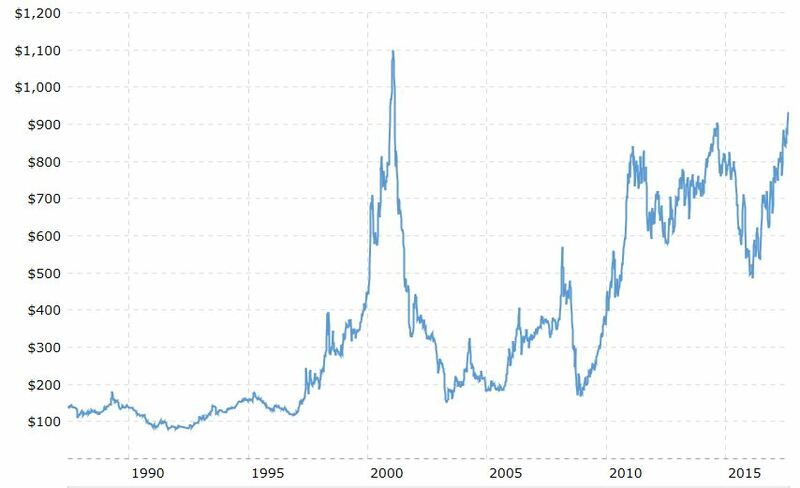 This level is being touted as a psychological barrier which, when broken, could see gold perform in a way not seen since its 2011 run when the inflows of speculative money drove prices up $500 in just nine months. However, it might not be political events that push it past this barrier. 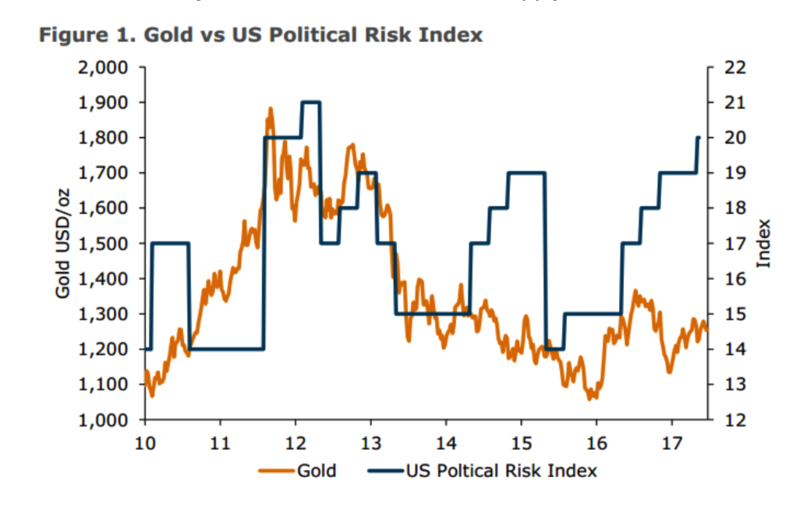 Interestingly if one looks at gold’s behaviour in the last seven or eight years, it has not reacted to political tensions (see graph below). Instead, it has been mainly affected by monetary policy, QE, the hunt for yield and shifting inflationary / deflationary concerns. An interesting point to consider as it is, arguably, counterintuitive. Therefore, we may see gold break through the $1,300 barrier on account of the US Federal Reserve whose last minutes surprised the markets. Whilst they gave no indication as to how the FOMC might move ahead, they did show a lack of consensus between members. Janet Yellen previously indicated there might be three (or even four) possible interest rate rises for 2017. So far, we have had two of these which have increased U.S. interest rates by 50 basis points. These latest Fed minutes are perhaps suggesting that the FOMC is unlikely to implement even a third rate rise this year. This should not be surprising given the lack of recovery in the US economy, inflation not meeting the required 2% and employment levels failing to reach targets. However, we should not dismiss political tensions and their push for safe haven demand. Central banks may talk and talk but the bottom line is that ultra loose monetary policies are set to continue and remain very supportive. For many decades we have not seen a geopolitical situation so tense, where it feels so many countries are looking over their shoulders at what could come next both in terms of political and financial threats. The push over $1,300 could be due to a perfect storm of financial, economic and geopolitical risks, each pushing investors to look for a safe haven and time-proven financial insurance. 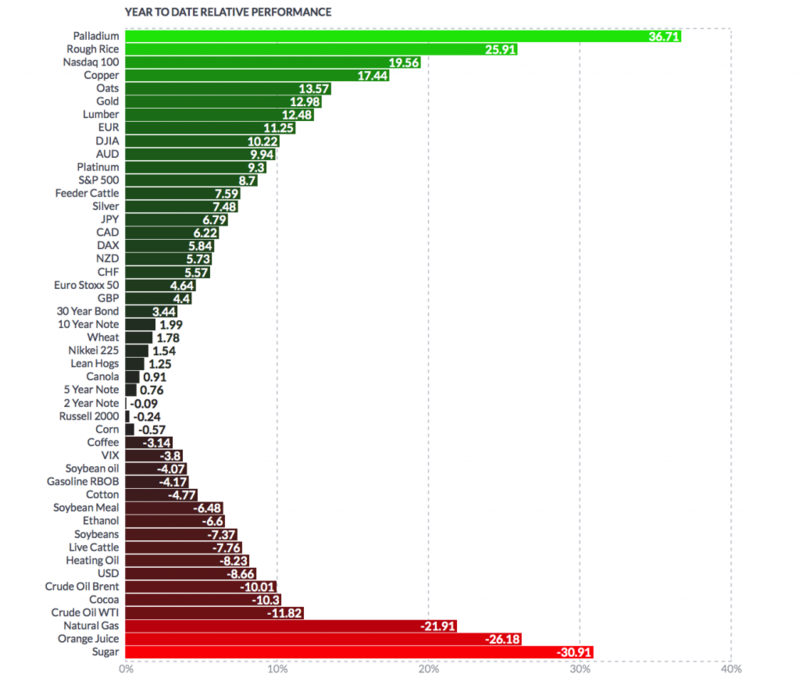 Palladium is the best performing precious metal this year. This is not thanks to events which happen today and (sadly) become tomorrow’s news. Palladium’s stellar performance is thanks to a series of decisions and events which have caused a major supply deficit whilst demand continues to climb. The same can be said of gold and silver. Investors must not look to one-off events such as a terrorist attacks or an angry Tweet from Trump. It is when these events are no longer isolated incidents and instead form a much bigger picture about the uncertain state of the world. This picture is taking shape and is slowly impacting the way people look at their finances. Soon, the picture will be much clearer and will drive safe haven investment demand. In the meantime, those with clearer foresight would do well to see the climbing numbers in the performance chart and realise now is a good time to take advantage of low prices and insultate and rebalance your portfolio with some safe haven protection in the form of allocated, segregated gold and silver bullion. Given these many risks, there is no good reason, that gold and silver will not follow palladium's lead and surge to multi year highs in the coming months. Founded in Dublin in 2003, GoldCore were Ireland’s first gold broker and are now Ireland’s most established and trusted gold broker. GoldCore are an Irish based and Irish owned company who have become one of the leading gold brokers in the world, serving clients throughout Ireland and in over 45 countries internationally.